Today Mary Drost, of Planning Backlash, went to a Forum in South Yarra to meet the 14 candidates for Lord Mayor of Melbourne. She says, "We need a good Lord Mayor and not one who will overdevelop and wreck our city even more. These last few years have been terrible. Go and take a look. If you use a search engine to check the population of cities in North America and Western Europe, you will find that Melbourne and Sydney are bigger than all cities except New York, Toronto, London, Paris and Berlin, and add Singapore as that is first world also. We are increasing much too fast - it is wrong." At the forum, there were ten mayoral candidates and a big crowd of residents. There were probably developers there as well. "You are head of the Property Council, so, if a development was proposed and the residents objected to it, but the Property Council urged you to approve it, what would you do? Sally gave a long answer, which Mary thought really said nothing, seeming to say that she would support the residents if they all thought the same. Mary responded, "But you hate resident groups, I learned that at Planning Panels." 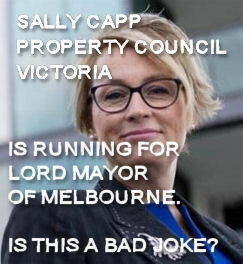 Mary says she thinks it would be a disaster for Melbourne if Sally Capp gets in. She would vote for Gary Morgan or Michael Burge or Sally Warhaft. At the bottom of her list would be Sally Capp, Ken Ong and Rohan Leppert. She adds that the council has been so dysfunctional, that she doesn't think it is a good idea for a present councillor to be Lord Mayor. Leppert was Deputy Chair of Planning and Ong was Chair. "Think of the damage to Melbourne with their planning in the last few years," she concluded.